The goals of the band are to bring musicians with a wide variety of experience together and share in a creative and enjoyable musical endeavour. We currently have members ranging in age from late teens to almost 80. 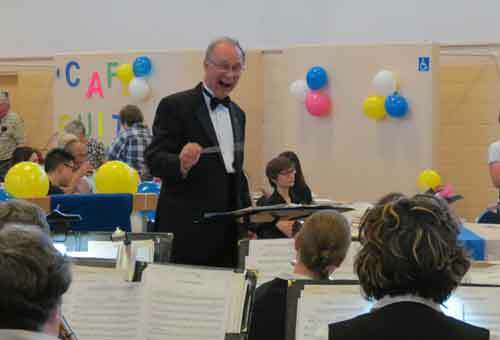 The Westshore Community Concert Band is a volunteer community band for the Westshore, giving musicians of all levels of experience an opportunity to share in a creative and enjoyable musical endeavour, and providing musical support for community events, especially in Colwood, Langford, Metchosin, View Royal, Esquimalt, Highlands and Sooke. New members who play French horn, clarinet, alto or tenor sax, euphonium or percussion are welcome. We can also find room for an experienced bassoonist and a couple of trumpets. If you have at least 3 years of playing experience you might like to attend a rehearsal to see how well you would fit into the group. For more information contact us at conductor@westshoreband.org or info@westshoreband.org. Rehearsals take place at 7:00 p.m. on Tuesdays, at The Forge church, 2612 Sooke Road. Please bring your own music stand if you have one. See Venues for details about parking. THANK YOU! to all the donors and volunteers who contributed to CAFÉ SUITE 11. We couldn't have done it without you. The May 12, 2018 event was a big success, with good music, tasty refreshments, humour, book sale and silent auction. A list of donors for the event is on the Donors and Donations page.